Urban revitalization & immigrants are killing suburban "white flight". As the nation’s white population ages and stagnates, the childbearing population is increasingly made up of minorities, who are increasingly drawn to the suburbs. In fact, whites are hardly the lifeblood of suburban growth anymore. As noted in my book, “Diversity Explosion,” whites contributed to only 9 percent of total suburban population growth in the nation’s 100 largest metropolitan areas between 2000 and 2010. Nearly one-third of large metropolitan area suburbs experienced absolute declines in their white populations over the decade. 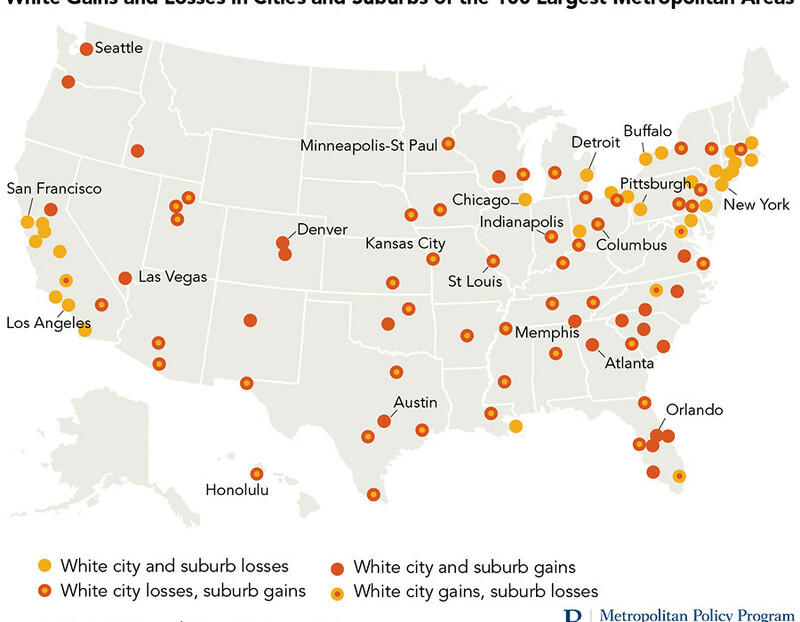 The greatest white losses occurred in suburbs surrounding large coastal cities—New York, Los Angeles, and San Francisco—where the cost of living helped drive whites to less expensive parts of the country, as well as the suburbs of northern industrial areas including Detroit, Cleveland, and Buffalo. Yet, 23 of these large [mostly-revitalized] metro areas recorded white gains in both cities and suburbs. Such places—which include Austin, Denver, Atlanta, and Las Vegas—are located primarily in the growing parts of the Sun Belt, and have been attracting whites from parts of the country that are either more expensive or are in a state of economic decline. See original article & image credit.